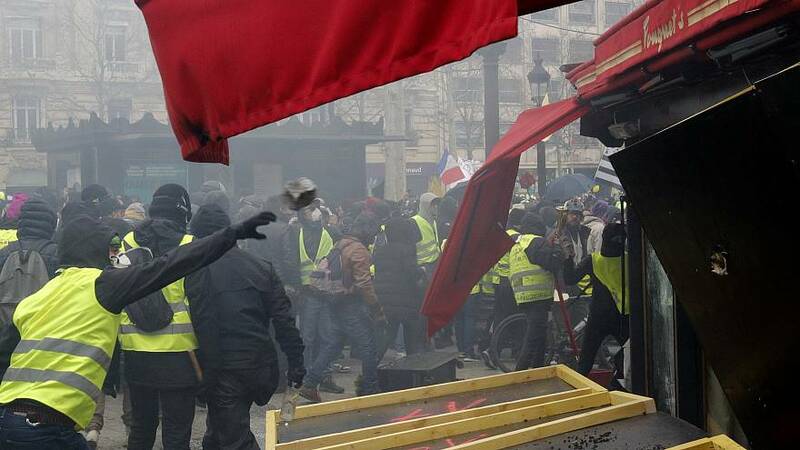 Paris began cleaning up the Champs Elysees on Sunday after looters ransacked luxury stores and set fire to a restaurant in the latest bout of anti-government protests. The 18th consecutive weekend of Gilets Jaunes (Yellow Vest) protests erupted into violence on Saturday, forcing the French President to cut a weekend ski holiday short and return to Paris for an emergency meeting with ministers. Macron's office said it will present plans on Monday to crack down on rioters while Prime Minister Edouard Philippe’s office said Saturday's violence showed current security arrangements were “insufficient”. The statement from Phillipe's office also said the prime minister would present Macron with the necessary measures to "to adapt the security forces stance so they can act with firmness at any time”. Opposition politicians accused the government of not being prepared for the rioting. “No one can say that the necessary security measures were in place,” said Jean-Christophe Lagarde from the centrist Union of Democrats and Independents party. Meanwhile, Paris mayor, Anne Hidalgo, said she wanted the government to explain what happened and demanded it reacts. Hidalgo told Le Parisien newspaper the “social and political crisis” in France was increasing divisions. Rioters left hardly any store unscathed on the boulevard. Nearly 80 shops and restaurants, including the brasserie Fouquet's, a hangout frequented by politicians, were torched, looted, or vandalised. “What happened today on the Champs-Elysees is no longer a demonstration,” said Macron at the emergency meeting. “All those who were on the avenue were “complicit in this...Many things have been done since November, but today shows that on these matters we are not there. I want to make strong decisions as soon as possible so that this does not happen,” he added. The Gilets Jaunes movement was born out of anger of a proposed fuel tax hike and started in mid-November but spiralled into broader protests, which turned violent in December, at the high cost of living and Macron's pro-business reforms. The protest turnout has dwindled somewhat since Macron unveiled concessions for low-paid workers and some pensioners and led a nationwide debate on tax and public services. However, Saturday's demonstrations have suggested a renewed momentum for the group and suggest the 'Grand Debat' has failed to quell public anger. Police estimated that 10,000 people joined the latest protest in Paris and Interior Minister Christophe Castaner said a hard-core of about 1,500 was intent on causing trouble.